The data for apples and pears is now available on the Harvest to Home website, with the data revealing some positive trends for both industries. The value of apple sales for the 52 weeks ending 1 December 2018 grew by +4.7 per cent compared to the prior year. Compared to other fruit categories monitored, apple dollar sales grew at a faster rate than that of the total fruit category (+1.1 per cent), avocados (+2.5 per cent) and berries (+2.1 per cent). The growth of apple dollar sales is being driven by the increase in how much households are spending on apples per buying occasion, with average spend sitting at $3.70 per occasion this year compared to $3.50 the prior year (+$0.20). 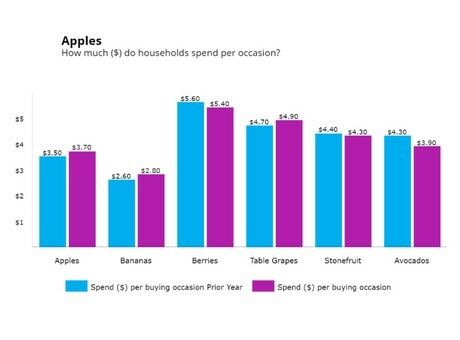 Along with apples, bananas and table grapes have also both experienced a slight increase in spend per occasion (+$0.20), while berries, stone fruit and avocados have all experienced a slight decrease. For the 52 weeks ending 1 December 2018, the volume (kg) of apples sold was down slightly (-2.2 per cent) compared to the prior year. However, this rate of decline is slower than that of bananas, which slipped back -4.2 per cent in the same period. The decline in volume sales for apples is driven by the decline in the number of households buying apples, which fell slightly from 89 per cent to 87 per cent. However, over the last 52 weeks, the number of times people purchased apples during the year has stayed flat at 13.6 times per year. Additionally, the volume of apples purchased per buying occasion remained flat at 1.1kg, which is a trend consistent across the total fruit category, including bananas and avocados. For the 52 weeks ending 1 December 2018, pear dollar sales grew by +6.3 per cent compared to the prior year. 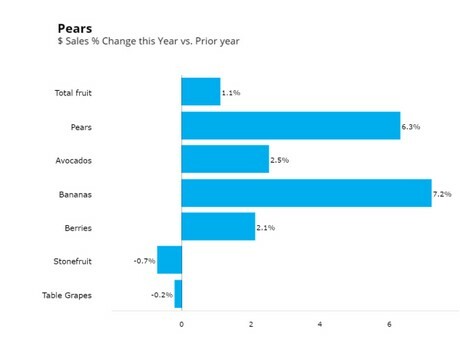 Similar to apples, pear dollar sales grew at a faster rate than that of the total fruit category, avocados and berries. Contributing to this growth is an increase in purchase frequency for pears. The average number of times people purchased pears this year was seven, up from six and a half times the previous year. Over the last 52 weeks, the number of households purchasing pears has remained flat compared to the prior year at 62 per cent, and the average amount spent on pears per occasion was also flat at $2.20, both of which are trends that are consistent with the total fruit category.